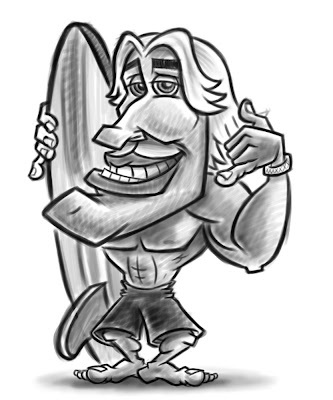 Sketch of a cartoon surfer dude for a batch of characters I am working on for a current project. Original sketch was done in pencil, scanned into and cleaned up in Photoshop using the trusty Wacom graphics tablet. I was going for the "hang loose" hand gesture, but I think it came out more "call me".